National Child Traumatic Stress Network School Shooting: One-stop webpage with resources for schools, parents/caregivers/youth. 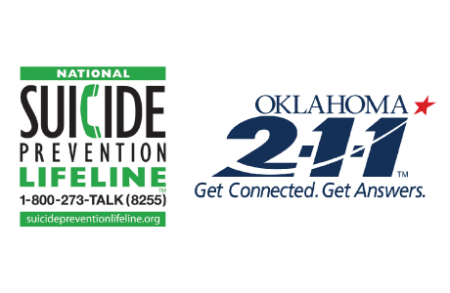 Mental Health First Aid training: A few years ago our state formed the Oklahoma Commission on School Safety and the Oklahoma School Security Institute. Part of this initiative included establishing a Mental Health First Aid training that is now available in our state. Program details can be found here ODMHSAS Mental Health First Aid program, along with a training calendar with several upcoming MHFA trainings. Are you – or is someone you love – struggling with thoughts of suicide? Call us at this National Suicide Prevention Lifeline number to get help at any hour. When you need someone to listen and provide support during incredibly difficult times, we’re here for you. It’s always worth the time to call. So many things in life can leave a person in crisis: the aftermath of a storm, the loss of a job, abuse at home, mental health struggles, bills higher than earnings. Perhaps you need help feeding your family or treating a medical condition. Dial 2-1-1 – or text your ZIP code to 898-211– we can provide the resources and support you need to get back on your feet. It’s free and confidential. We’re always here to listen to you, and we’ll help in any capacity we can. Call us today. You can search for resources online, just click HERE.